Bluegrass Pundit: 63% don't want Benghazi suspect Ahmed Abu Khattala treated like a common criminal..
63% don't want Benghazi suspect Ahmed Abu Khattala treated like a common criminal.. The same poll finds 53% want to keep Gitmo open. More than 6 in 10 people believe the captured Benghazi attack suspect is an enemy combatant who should be tried by military commission. According to a Fox News poll released Wednesday night, 63 percent want Ahmed Abu Khattala tried by military tribunal, and 29 percent believe he is a criminal who should be tried through the U.S. court system. Another 9 percent do not know. 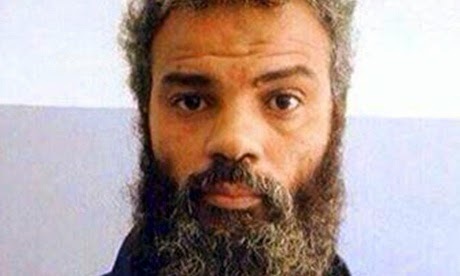 Earlier this month, the U.S. military and FBI captured Abu Khattala, a “key figure” involved in the 2012 terrorist attack in Benghazi, Libya, that killed U.S. Ambassador Christopher Stevens and three other Americans. He is the first suspect captured by the United States since the attack nearly two years ago. Khattala is expected to face trial in the U.S. District Court of the District of Columbia and is faced with three criminal charges. He is currently being transferred to the states on the USS New York.